Coffee as an herb... — Amy Chitwood Burslem, LAc. I admit it. Coffee is one of my favorite herbs. Having done several stints as a barrista through my undergrad, I continue to have a love/hate relationship with coffee that has finally developed into an appreciation I can live with. I didn't really drink coffee until my 20's, which is about the time asthma became a bigger part of my being. I found that when I was having a difficult time breathing and didn't have access to an inhaler, I'd take a shot of espresso and would be able to breathe a little easier. Thus began my appreciation for "the bean." Upon entering Chinese Medicine school a few years ago, I was afraid that they would ask me to stop drinking coffee. They didn't, and I was glad. While searching for literature to prove to myself that it was fine to drink, I stumbled across Subhuti Dharmananda's article. He states that one cup a day is usually fine, and even beneficial for adults. 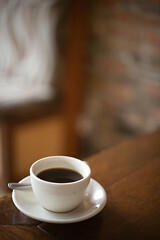 Coffee is often seen as too much of a stimulant, which adds to the stress of life in America as a lot of us know it. Keeping it at a minimum is a good idea- pounding back two or more 20oz. coffees a day isn't. Check out a Canadian LAc's viewpoint of coffee here. As with all herbs and substances that are potential stimulants, be careful of what you mix with medications and other supplements. Know what you are drinking, and choose organic and fair trade when you can. I recommend Stumptown.